Born on 15 August 1856 in Regiment 22 of Mecklenburg County, Virginia, Lillie Dodson was one of ten children: Greene, Virginia, Harvey, Henry, Dora, Molly, Adlaide, Rebecca Eulelia (Lillie), Edward, and William Rowlett (Bud). Her parents, James H. and Sarah Jane Rowlett Dodson, farmed land just off the Boydton Road south of The City. Mr. Dodson was a planter and slave owner. Miss Rowlett moved with her parents from (Chesterfield County, Virginia) and settled on land adjoining the Dodson plantation. They were united in marriage in (1844) in Mecklenburg County, Virginia. Mr. Dodson built the old Dodson home and moved into it when Lillie was three years old, about 1859. She said she could remember walking across from the “Old House,” climbing over the felled trees, carrying her dolls. The house had not been completed, and as the War soon started, he never did finish it. Mr. Dodson gave each of his children a tract of land for a homestead. He gave the Dodson house and a certain number of acres to the three unmarried daughters, Dora, Molly and Lillie. …Soon after moving to Virginia with his parents in 1870, Clifton Sayles paid court to Lillie Dodson (a neighbor girl). Her parents were still living, and twas too soon after “The War between the States: ended; feelings still ran high. For Clifton’s father, Ira Sayles, had been a Captain in the Federal Army, and Lillie’s brother, Greene Dodson, had been killed while serving in the Confederate Army; consequently Lillie’s parents did not favor the suit, and Clifton married another girl. This wife, Anna McCullough, died sometime after the census date of 1900, and Clifton again paid court to Miss Lilly, who had remained single. Clifton Duvall Sayles, born April 11, 1851, in Alfred, N.Y., and Rebecca Eulelia (Lillie) Dodson were united in marriage January 9, 1901 in Mecklenburg County, Virginia. Born to this union: Anna Florette, born December 4, 1901. George …was a real son to them. He continued to care for and look after them untill their final illnesses and deaths. He called Ed “Master Ed” and said Aunt Dora and Aunt Molly and called their sister Aunt Lillie. In appreciation of the love and care George bestowed on (them) Ed Dodson deeded George Ricks Strickland the old Dodson home place. Around 1920, George Strickland drove a wagon over to the Sayles home and paid court to Florette. They were married September 28, 1921 in the Baptist parsonage in Chase City, Virginia by the Rev. H. L. Williams. Four sons were born to this union: George Sidney, Clifford Ricks, Paul Warren, and Norman Scott. 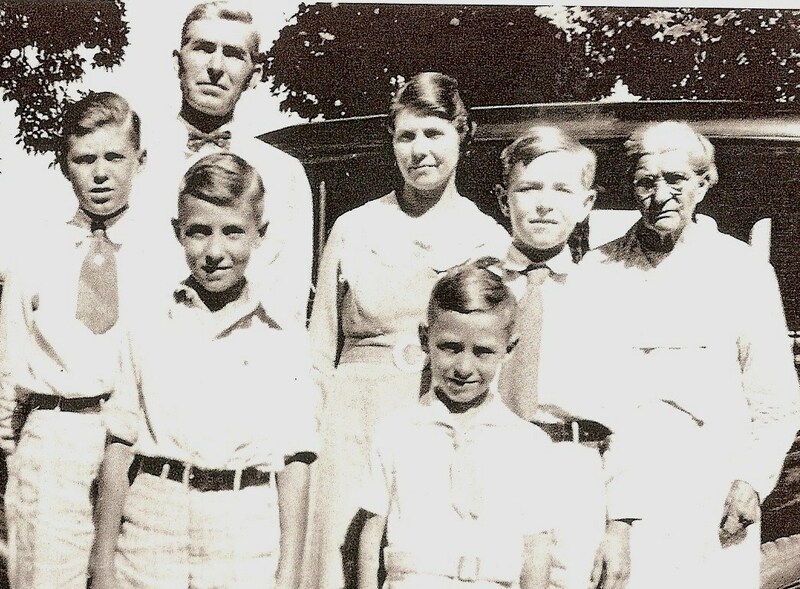 The family survived the depression by returning to the Dodson farm. At around the same time, Clifton Sayles died, leaving Lillie a widow; she moved in with her daughter and nephew to help raise the four boys–and made certain that cookies were a regular part of their diet. Source: Strickland, Anna Florette. 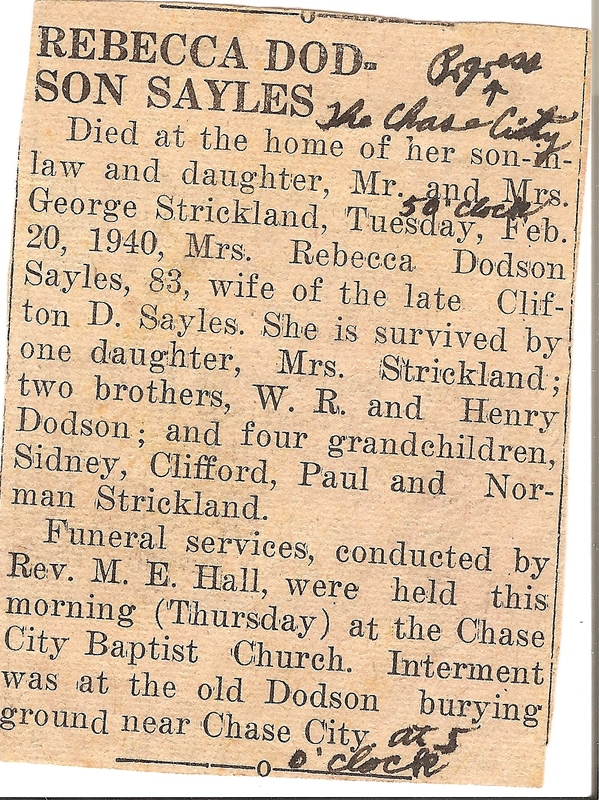 Some Genealogical Facts of the Strickland-Sayles Family. Chase City, VA: Handwritten, March 1976. Another brick wall in tracing the Dodson family had been hit. My Grandmother Strickland’s Genealogical Facts of the Strickland Family plunked the family down at the Civil War. Great. Just great. How did they get to Mecklenburg County, Virginia? What resources could they count on? How did they meet prospective spouses? Why did they stay when so many residents of southside Virginia were moving on west? Discovering an online source of original documents has been one of the most important moments in my budding genealogical life. Footnote.com has diverse collections with new offerings being added regularly. The footnote viewer is by far the best image viewer anywhere. Stumbling onto this digital archive I whimsically started searching the Dodson side. Lo! and behold! A pre-Civil War document popped up in the Revolutionary War Pension Records. When viewed it became clear that this was just one piece of a 75 page file, filled with family information from the 1840s and 1850s. A pension for Revolutionary War soldiers and their widows was granted by Congress in 1832. Young men fighting in the Revolution were by then elderly men needing lots of neighborly attestation and official witness. Elderly men died and their widows petitioned to receive the awarded funds; their claims of marriage also needed neighborly attestation AND male family intervention since women could not own property or evidently handle money. In the pension application pulled by my Dodson query were details about William Rowlett and Rebecca his wife–both mentioned in my Grandmother Strickland’s family history as the parents of Sarah Jane Rowlett Dodson who married James H. Dodson in 1844. 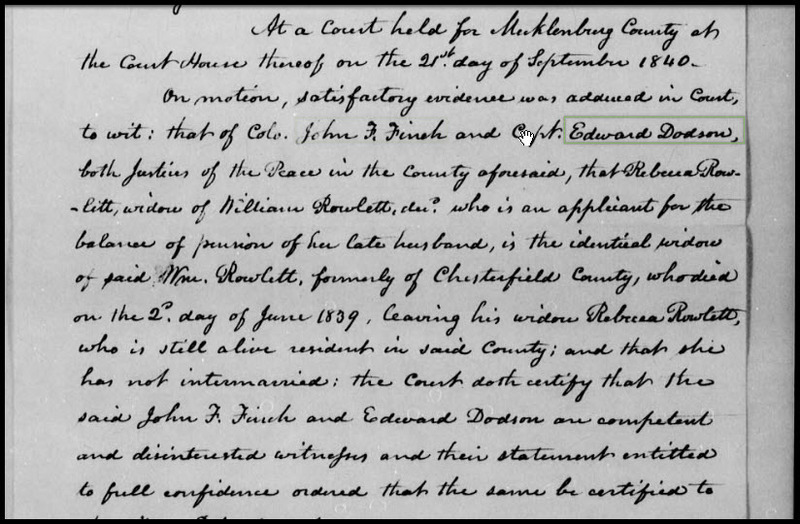 The Edward Dodson attesting to the validity of William’s claim of service and Rebecca’s identity was both neighbor and Justice of the Peace in Mecklenburg County. Further footnote documents, newspaper articles and register reports suggest that this Edward Dodson is my great-great-great-grandfather. In later papers James H. Dodson acts as agent for his mother-in-law, Rebecca Rowlett. These are my peoples! This file records some keystone information, in addition to personal details. I LOVE footnote! The site’s multiple collections can be sorted by time frame, name, place, and date; and the search engine, though requiring some patience, is quite good. Within the viewer an historian can read documents and make annotations and/or comments so that subsequent readers get even more from the document. The site also has the capacity to store, organize and share your family’s documents, including your uploaded photos and documents. Follow me to footnote.com! But be prepared to get lost in time! 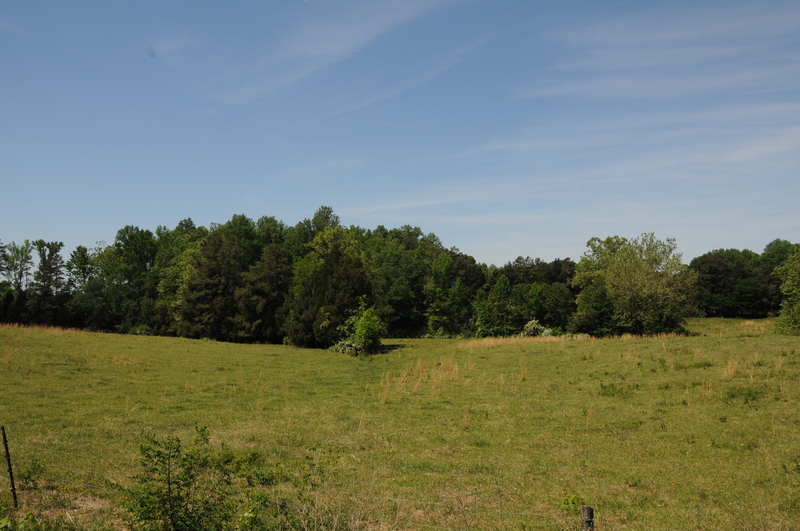 My ancestors include well-to-do farmers in Mecklenburg County, Virginia. James H. Dodson (1815-1884) was a middling planter; in other words, he owned enough slaves to not work along side them in the field but not so many as to be considered upper-crust in his society. In the gathering shadows that my research summons are the shapes of people, folks he owned, black pioneers who helped him plant and harvest the foods he placed on his family’s table and the tobacco he sold in his community’s auction. I have uncovered little information about the women of James H. Dodson’s life, and even less about the slaves that worked his land. Both our federal and state governments found the gathering of census information to be useful quite early in our nation’s history, and the reams of resultant data provide valuable glimpses into the past. One such census was begun in 1853 by the Commonwealth of Virginia; its purpose was to conduct an annual registration of births and deaths. The Slave Birth Index was transcribed for the years 1853-1865 by the Works Project Administration and recorded on microfilm in the 1930s. To make this information more accessible to genealogists and family historians, the volunteers and staff of the Alexandria Library transcribed the microfilm in the 2000s, making it available in a multi-volume print record. It is from this source that some of my family’s shadows get names. Morales, Leslie Anderson., Ada Valaitis, and Beverly Pierce. Virginia Slave Births Index, 1853-1865, Volume 2, D-G. Westminster, MD: Heritage, 2007. Print. This post is the next in a series about the Civil War service of William Greene Dodson, detailed in A Mom’s Goodbye, The Cruel War Is Raging and The Cruel War Is Raging, Johnny Has To Fight. Muster cards—concise who-what-when story lines. I LOVE these mines of family history. My current extraction comes from the Civil War Service Records, housed in the National Archives and digitized through Footnote.com. I add my knowledge of 1860 Federal Census data for Mecklenburg County, Virginia and my grandmother’s family history to discover that Greene Dodson served as a private—without pay– in Company B, 34th Regiment Virginia Infantry for the months of May and June 1864, having enlisted in Mecklenburg County on April 15, 1864. T. T. Pettus enrolled Greene for the duration of the war, and told him that he was entitled to a bounty for his enlistment. The muster card for Ben Dodson shows that he, too, served—without pay– for those spring months. Muster cards provide the who, what and when—but not the why, where and how of a fuller family story. I was spurred into this deeper research by some mystic mom-to-mom connection: What battle action did Greene Dodson see? Where was he stationed? What news would Sarah Jane receive about her son? First I had to address my limited knowledge of military jargon, and place Greene into a larger Confederate force. Company B was one of perhaps 10 companies in the 34th Regiment Virginia Infantry. Each company was hopefully close to its 100 man quota. The 34th Regiment was serving with the 26th, 46th and 59th Virginia Regiments, forming a brigade under General Henry A. Wise. The brigade had been called from duty on Richmond’s fortifications in September 1863 to join General P.G.T. Beauregard’s Department of the Carolinas and Virginia, defending the coastline of the Carolinas. With this knowledge I knew then that Greene and Ben Dodson were serving under the Beauregard command in May and June. A quick scour of the Internet led to a speech given in 1870 by Henry A.Wise in which he gave the history of the brigade under his command. Thus young Greene, just barely 18, ended his first month of service to the Confederate States of America. June 1864 saw the arrival of Grant’s troops in the Petersburg area. Having been defeated again and again by a tenacious rebel army, Grant decided to leave Lee guarding Richmond from the north and east, sweep broadly east across two rivers, and lead his army up the James River, capturing the railroad center—Petersburg—before trying once again to capture the capital, Richmond. General Beauregard was the first Confederate commander to scout and anticipate this bold Union plan, and while waiting for Lee to concur and send supporting troops, Beauregard had to defend Petersburg with a mere 15,000 men, Greene and Ben Dodson among them. Lee had, at the eleventh hour, finally agreed with Beauregard’s conclusion about Union troop movements. His orders to send reinforcements to the south’s railroad heart 17 June kept Petersburg from falling, but the 34th Regiment and the rest of the Confederate line had retreated to a more defensible line, dug by slaves, citizens and soldiers bearing tin cups and bayonets. The trenches of Petersburg were now full. Their occupants, Greene and Ben among them, would remain in contact with the enemy for nine more months, and their interactions determine the outcome of the Civil War—for the Dodson family, the state of Virginia and for the Union of the States. I imagine the newly enlisted man-child, Pvt. William Greene Dodson, sitting on a train to Petersburg, in the company of his uncle, Sgt. Benjamin F. Dodson and other Mecklenburg County farmers. The sights, smells and sounds of battle were yet but words from others’ mouths. Would this young man have been excited? Scared? Resolute? Company B, 34th Virginia Infantry arrived in Petersburg May 1864 as part of Wise’s Brigade, under the command of P.G.T. Beauregard, and were charged with the protection of the railroad hub. Greene and Ben would have welcomed the local Citizen’s Militia who helped swell the troops’ numbers to a scant 2,200 bodies. Perhaps Greene wondered what kind of hell he had entered, as he stared at this landscape, stripped of trees, riddled with tunnels, rifle pits and bombproofs. A bleak reality must have confronted the young soldier, even before the first bullets whistled in his ears.